When cornering hard, Darts tend to roll somewhat and this can be contained by installing my anti-roll bar kit, or sway bar kit as some prefer to call it. The kit uses Triumph components to achieve an installation that controls body roll, is relatively easily fitted and can be simply returned to standard if required. The bar is located within polyurethane sleeved brackets which mount under the chassis frame. The outer end of the bar are linked to the lower wishbones using brackets that fit pre-existing mounting holes on the bottom wishbone. 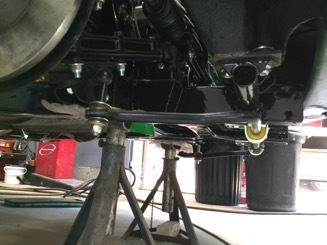 Be advised that the effectiveness of the roll bar will only be realised if the suspension is in good order and preferably has been fitted with p/u bushes to control extraneous movement. In particular, ensure the lower wishbone has not been weakened by heavy corrosion which is an issue with some cars. 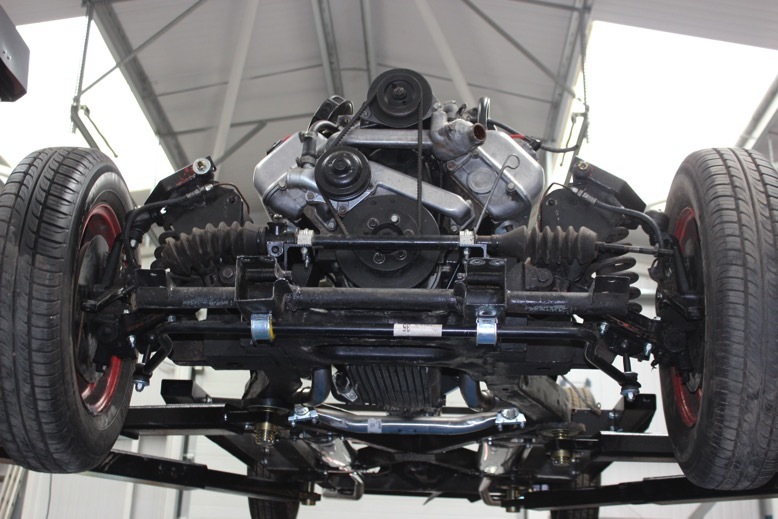 Note that the roll bar is underslung and will reduce ground clearance by approximately 25mm. Fitting the anti roll bar requires both chassis rails to be drilled to accept the set screws used to attach the roll bar bracket to the chassis. The kit includes a captive plate (pictured below) which can be installed without having to remove the bumper mounting bars or the road wheels. Fitting instructions can be accessed via this link. This is a general view of the installation. Note the chassis has to be drilled to accept the mounting bolts. Note also the reduction in ground clearanceof around one inch. The left hand picture shows the link to the lower wishbone. 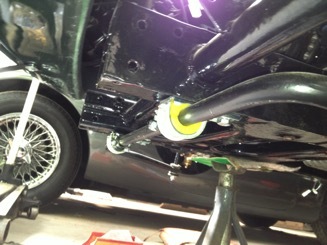 On the right you can see the roll bar mount and polyurethane bushes. 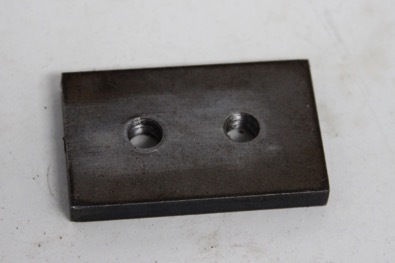 This captive plate fits inside the chassis and receives the set screws used to attach the anti roll bar mounting brackets.